Spooky Halloween Card PSD Pack - Free Photoshop Brushes at Brusheezy! October is almost here and that means it's time to get ready for Halloween! With this new Spooky Halloween Card PSD Pack you'll be able to get your scare filled designs ready for All Hallow's Eve. 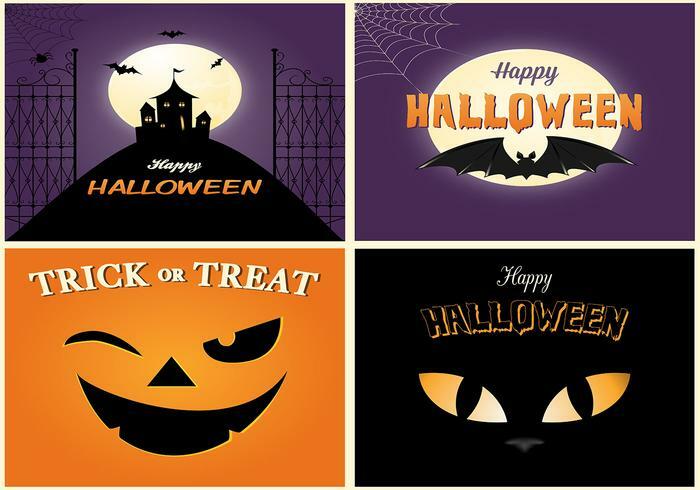 Included in this pack are four different Halloween card PSD files with a different Halloween design on each. Use the cat eye Halloween PSD, jack-o-lantern, and 'Happy Halloween' PSD cards this season and then check out the <a href="http://www.vecteezy.com/holiday-seasonal/58455-spooky-halloween-card-vector-pack/premium ">Spooky Halloween Card Vectors</a> over on Vecteezy!